The National Weather Service has cancelled a tornado watch for Fairfield and Litchfield counties. It issued the watch earlier Monday morning, but cancelled it around 5:45 a.m. There are however, a number of advisories including wind, fog and flood advisories. At 5:24 a.m., a strong thunderstorm was located over Milford, moving northeast at 40 mph.Winds in excess of 40 mph are possible with this storm. Locations impacted include New Haven, Waterbury, Meriden, Milford, Middletown, Wallingford, Naugatuck, Guilford, Wolcott, Clinton, Durham, Hamden, Stratford, Cheshire and Branford. 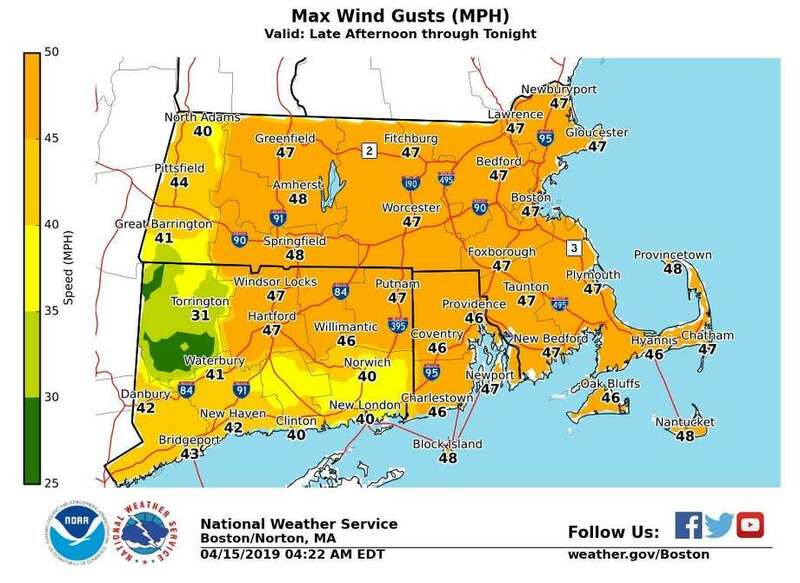 The National Weather Service has also issued a wind advisory for all of Connecticut from noon until 2 a.m. Tuesday. “A Wind Advisory is issued when sustained winds of 31 to 39 mph,or gusts of 46 to 57 mph, are expected or occurring. Winds thisstrong can make driving difficult, especially for high profilevehicles, in open areas, and on elevated roads and bridges. Use extra caution,” the NWS says. The last severe damage from tornadoes happened on May 15, 2018. Monday: Showers and thunderstorms before 8 a.m., then a chance of showers between 8am and 11 a.m., then a chance of showers and thunderstorms after 11 a.m. Temperature rising to near 65 by 11am, then falling to around 51 during the remainder of the day. Windy, with a southwest wind 10 to 15 mph increasing to 21 to 26 mph in the afternoon. Winds could gust as high as 40 mph. Chance of precipitation is 80 percent. New rainfall amounts between a quarter and half of an inch possible. Monday Night: Mostly cloudy, then gradually becoming mostly clear, with a low around 36. Wind chill values between 25 and 30. Breezy, with a west wind 16 to 22 mph, with gusts as high as 40 mph. Tuesday: Sunny, with a high near 58. Wind chill values between 30 and 40 early. West wind 14 to 16 mph, with gusts as high as 29 mph. Tuesday Night: Partly cloudy, with a low around 40. Northwest wind 5 to 10 mph becoming light after midnight. Wednesday: Mostly sunny, with a high near 58.